Ginger to the rescue! There’s absolutely no need to run to the pharmacy for some chemical filled, over priced, garbage. I eat candied ginger for nausea all the time. In fact I just made a batch last week for a road trip car sickness remedy. Heck I’ve even been known to toss some powdered ginger in my dog’s food pre car ride. My dad also uses ginger and says it’s the best thing he’s found for his heart burn (prescription medicine included). It can be a tad expensive to buy though. Thankfully it’s one of those weird things like salad dressing that we all just buy now in though it’s totally easy to make. It’s just three ingredients! Plus in the process of making candied ginger you make ginger syrup with no extra steps! It’s great to add to herbal teas when you’re feeling under the weather. You barely even have to measure for this recipe. Step one: grab some fresh ginger and get it peeled and sliced/diced to whatever size and shape you desire. Keep in mind they do shrink a little bit as we’re about to cook them. Step two: simmer your ginger in water until it begins to soften. You’ll need the water to cover all your ginger and the water will end up being your syrup. Keep your pot covered as it simmers to keep from boiling off all the water. Step three: add the same amount of sugar to the pot as you added water. For example if you used one cup of water you’ll need to add one cup of sugar. Simmer for an additional 10 minutes. Step four: strain the pieces out of your syrup. Save and bottle the syrup and set the pieces on a tray or rack to dry. I used one of the trays out of my beloved excalibur dehydrator. Step five: when the pieces are tacky but no longer wet feeling coat them with sugar. This will keep them from spoiling or sticking together in the container. I found a combo of vegetable peeler and a knife worked best for peeling the ginger. If you coat your ginger pieces with sugar too early the sugar will just become wet and won’t prevent sticking. I keep my syrup in the fridge and add it to teas and seltzer water for quick “homemade soda.” If you’re in an off grid situation the syrup should last quite awhile un-refrigerated. Experiment with piece size. I found that I need a much smaller piece to cure my nausea than I originally thought. If you hate ginger but still want its awesome benefits make pill size pieces and swallow them. The sugar coating means you don’t get the spice of ginger until you start chewing. Linked to the Healthy, Happy, Green, & Natural Party Hop. 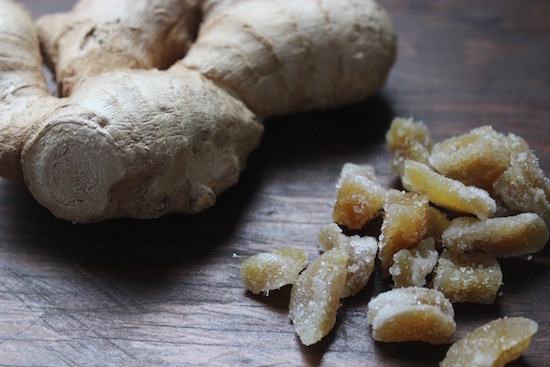 9 Responses to "DIY Candied Ginger and Ginger Syrup"
We love eating homemade ginger candy! I was intimidated by it at first, but so glad we tried it. These look delicious! I can’t wait to try and make them. 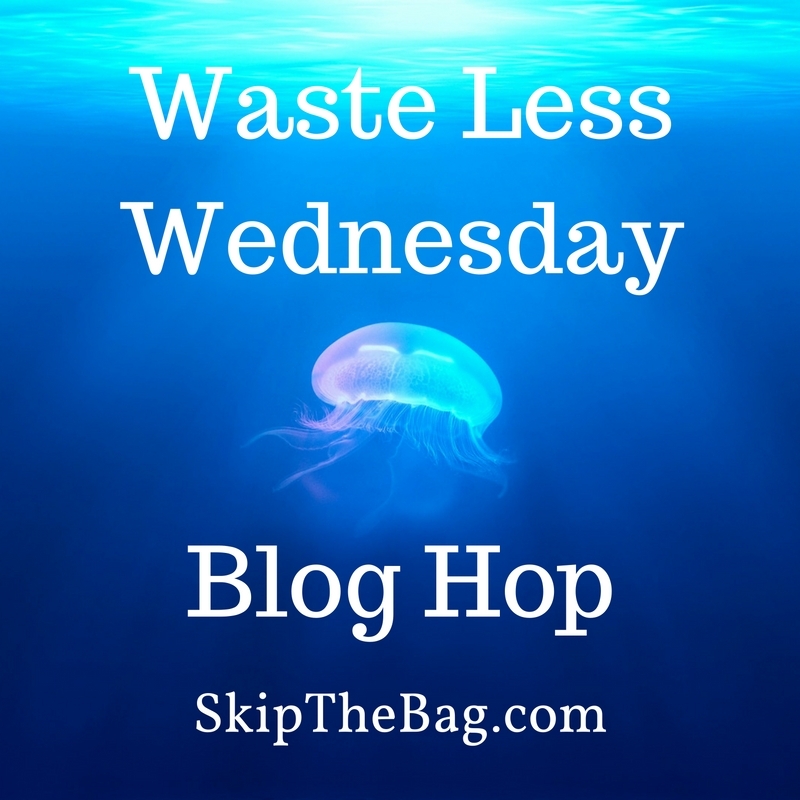 Thanks for sharing on the Waste Less Wednesday Blog Hop. This post is so enlightening! Ginger is one of my favorite go-to natural remedies. It is especially useful to me when I have a cold or congestion. 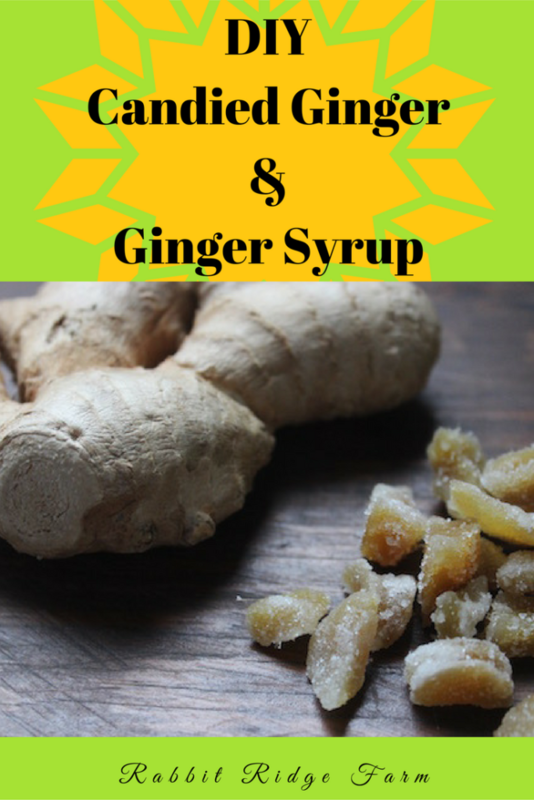 Thank you so much for sharing how to make DIY Candied Ginger And Ginger Syrup at the Healthy Happy Green and Natural Party Blog Hop. I’m pinning and sharing. Wishing you a healthy, happy year ahead! My husband loves candied ginger dipped in dark chocolate. I think these might become a birthday gift next month! Thanks, for sharing! Oh the chocolate sounds so awesome! I’ll have to try that. Ginger is very useful for diluting blood and improving the general condition of our body.